Catalan painter. He was active in the provinces of Tarragona and Lleida (Sp. Lrida). When living at Tarrega, near Cervera (Lleida), he signed a receipt for a retable of St Lucy that he had painted for S Coloma, Queralt (29 Oct 1412), and contracted to execute a retable of St Peter for a stonecutter, Pedro Ferrarons, for S Joan, Vinaixa (29 Oct 1420). 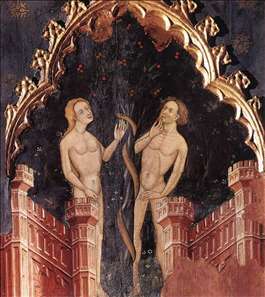 In 1432, while living in Montblanc, he was commissioned to paint a retable of SS John the Baptist and John the Evangelist for the high altar of the same church in Vinaixa; this was completed in 1435. In the contract for an altarpiece of St Michael for the church of Guardia Lada, near Tarrega (15 June 1421), he is recorded as having already executed another St Michael for a donor at nearby Verd (Lleida). 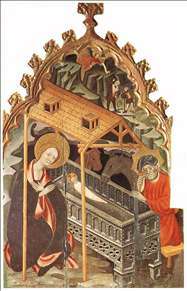 Of these documented works, only the central panel of the altarpiece from Vinaixa survives (1432-35; Tarragona, Museu Diocesa), but the retable from S Sebastian, Guimera (completed 1412; Museu Episcopal, Vic), and the Virgin de la Llet from S Mara, Cervera (Museu Nacional d Art de Catalunya, Barcelona), have also been attributed to him, although Post considered that he was a less refined draughtsman and a less sensitive painter than the Guimera Master. Attempts to identify Ramon de Mur with Bernat Martorell are unconvincing, although he may perhaps have worked in his atelier. Ramon seems to have been more of an imitator than a creative artist, but he was a fine colourist and had good descriptive abilities, and there is a sense of richness and elegance in his works, reminiscent of Franco-Flemish manuscript illumination. The retable of St John the Baptist in the parish church of La Pobla de Mafumet, north of Tarragona, may reflect his influence. See more details about "Birth of Jesus"
See more details about "The Fall"